400,- EUR to Mr. Marek KOVAČIK - production of photographies for the book "Owls" - 29.1.2011. 500,- EUR to Mr. Jan KRONER (director of Mala Scena Theatre STU) - contribution for the reconstruction of the theatre - 29.8.2011. 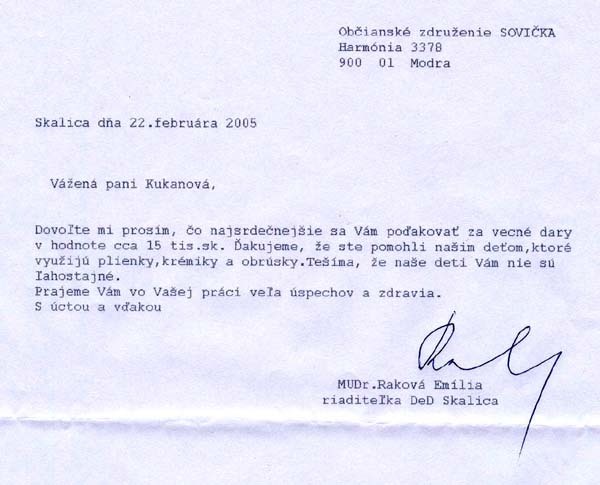 200,- EUR to Mrs. Tatjana STRNATOVA - as a support of courses at the art school - the purchase of a quitar - 13.7.2010. 160,- EUR to Mrs. Tatjana MAJERNIKOVA - support for the summer camp for the children with specific disorder of learning. "Little Owl Foundation financially suported 15th Haydn Festival organised by Czech Haydn Society - 2007". Our foundation supported the reconstruction of the sport ground "Areal Stare Grunty 53, Bratislava" by providing the sum of 11.OOO slovak crowns. Little Owl Foundation financially supported 14th Haydn Music festival organised by Czech Haydn Society from 15th till 23rd of September 2006. The foundation Sovička financially supported international scientific conference Information Use in Information Society held on 10.-11th of October 2006 at University Library in Bratislava. The Foundation Sovička financially supported Civic association Čitárna u čerta s knihou. The Foundation Sovička financially supported the reconstruction of the playground at Zavodisko in Bratislava. The Foundation Sovička financially supported Basic Artistic School of Jozef Kresanek at Karlova ves, Bratislava to execute children musical Wolf and Little Red Cap. The Foundation Sovička financially supported Dyslectic summer camp for children with specific disorders of learning organised by Občianske združenie pri Pedagogicko-psychologickej poradni in Košice. The summer camp take place in summer 2005. The Foundation Sovička financially supported 3rd national multimedia contest SlovakPrix Multimedia. President of the foundation lady Zdenka Kukanová awards the main prize in the category Special contest for the students, that promotes involvement of the students of the universities of various kinds to creation of multimedia. The empahis is places on the invention and professional execution. All proceeds raised from the sale of the book COKING WITH THE AMBASSADORS are devoted to the charitable purposes and will go the the account of the noninvestment fund Eyes (Oči), which provides the assistance to visually handicapped children in Levoča, part of the proceeds will also go to the account of special Basic school for autistic and mentally handicapped children at Hálkova street, Bratislava.